China threatened to retaliate against President Trump’s new tariffs on imported metals on Wednesday. The Dow Jones industrial average was down more than 300 points at midday. 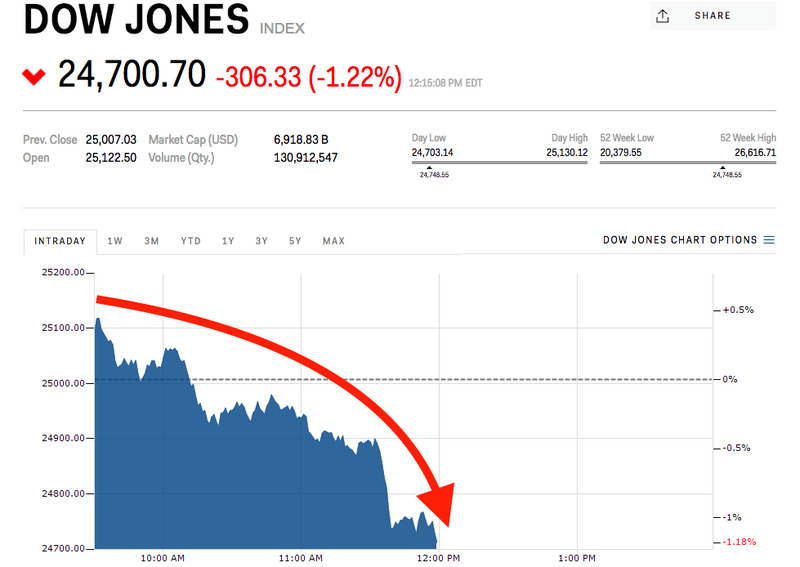 The Dow Jones industrial average fell as much as 306 points on Wednesday, as possible Chinese retaliation against the new metals tariffs stoke fears of a potential trade war. China’s National People’s Congress spokesperson Zhang Yesui on Wednesday threatened to retaliate to the US president’s proposed new tariffs on steel and aluminium, according to reports. China doesn’t want a trade war, the politician said, but it will respond in kind if Trump’s tariffs harm it economically. Boeing, which could be a potential target of retaliatory tariffs by China, was among the worst hit, falling more than 4% in trading. China has agreed to buy about $US1 trillion worth of aircraft over the next two decades from the company. Companies that get a high percentage of their revenue from China are also at heightened risk as the prospect of a global trade war mounts, according to UBS. The Swiss bank identified 11 stocks to avoid if a trade war does break out. Cryptocurrencies were also falling Wednesday after Google followed Facebook’s lead and said it would ban all advertising related to bitcoin, cryptocurrencies, or ICOs.